The Sun Suite is a splash of New Mexico in the heart of the mountains. The heated mosaic flooring is the pride of the suite and the spacious sun room can easily double as an extra sleeping area or yoga room. With 2 queen size beds in private rooms and the option to convert the sun room, the suite can sleep up to 6 guests. The Sun Suite also boasts a full stainless steel kitchen, air conditioning, bathroom with soaker tub and large dining area to complete your luxury Rocky Mountain vacation. The living room houses a flat screen TV, DVD player iPod dock, WIFI, books, board games and DVD`s. The suite also provides private parking, laundry facilities, a covered deck with BBQ & hot tub and unbelievable mountain views. The Sun Suite is located below the Green Chalet. 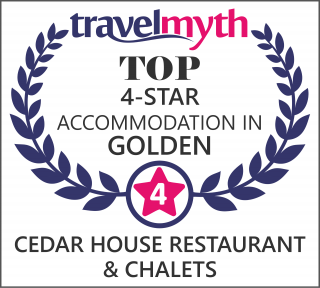 “Our stay at the Cedar Chalets was fabulous. As soon as we walked in we knew it was going to be a great place to stay…..it was so inviting, clean, comfortable looking. The kitchen was well stocked with dishes and pans as well as a few spices and foil wrap….the stuff you don’t know you’ll need til you start cooking. The in floor heat is great for warmth and for drying ski clothes after a day on the slopes. We took advantage of the hiking trails one afternoon which they keep maintained for snowshoers I think.